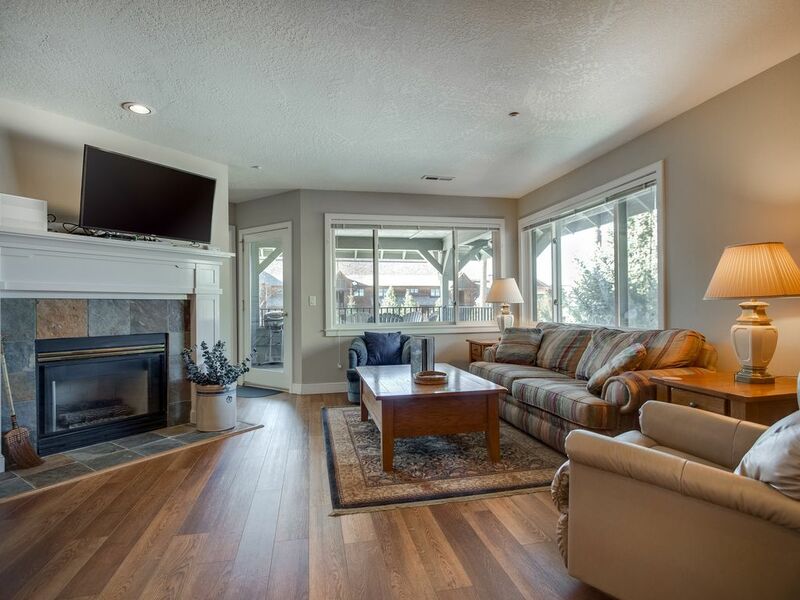 Relaxing is easy in this Coeur d'Alene sanctuary! This incredibly cozy abode with views of the marina and a shared swimming pool will make your next family vacation feel too good to be true. This comfortably furnished condo has plenty of amenities to make your vacation wonderful, including a lovely living room with plush furniture that opens up to the dining area and kitchen. You'll love stretching out on the sofa in the living room, switching on the cable TV and watching your favorite show or simply reading a book. Over in the kitchen, you'll have all the appliances you need - even a dishwasher to make cleaning up easy! When it's time to eat, you'll have a six-person dining table between the kitchen and living area. Six guests can sleep here in three bedrooms, and you'll have two full bathrooms to share. The master bedroom includes a luxurious king-size bed and connects to a bathroom with double sinks. The second bedroom has a queen-size bed, and the third bedroom has two twins - great for the kids! Warm summer days never looked quite this good! Back in the living area, you'll be able to step out to your private patio with gorgeous marina views and a barbecue grill. Other amenities include an elevator to all floors, a private washer/dryer, air conditioning, and marina access. If you need to keep connected, you'll only need to pay the a small fee for WiFi access. No matter the weather, you'll be able to enjoy the shared indoor swimming pool! At the resort, you'll also have access to an outdoor volleyball court. Coeur d'Alene is the perfect place to have adventures with plenty of outdoor activities nearby. From golfing to river rafting to Silverwood Theme Park, you'll never run out of things to do. Book your Idaho vacation today for nature, marina views, and a whole lot of fun! Welcome to your perfect vacation! Parking Notes: Your assigned garage space is marked B-201. Should you have more than one car, the second car must be parked outside the building in the open parking lot facing the volleyball court/pool house. Boat parking is available from Discovery Marina for $35 per day on "C" Dock. Dock Details: Boat parking is available from Discovery Marina for $35 per day on "C" Dock. Vacasa cannot set this up for you. See the Marina Mgr next to the pool house or call 208-819-6876 . Thanks for considering a Vacasa home! We provide full-service management for privately owned vacation homes, and like to think that we offer our guests the best of both worlds: the unique experience of staying in a one-of-a-kind vacation home, with the peace of mind that comes from knowing that the home you book for your special vacation is cared for by professional housekeepers and property managers. <br> <br> Vacasa began in 2009, simply because our founder and CEO Eric wanted to find a better way to share his wife’s family’s summer home in Long Beach, Washington with guests as a vacation rental. Eric and his early team worked to build Vacasa on the premise that local employees can do what they love most (taking care of guests, homeowners, and properties), while the hands-off tasks of vacation rental management���things like marketing, filing taxes, and maintaining a website—could be handled by a specialized central support team. <br> <br> Our passion is connecting travelers with the unique experience of staying in a vacation home, and we would be honored to be your host. Please contact us with any questions about this home—our team is standing by!